Cool isn't it. You'll get your favicon uploaded soon. Follow these simple steps and you will be set. First step is to make a favicon for yourself. If you have already made it you can follow the next steps. Go to this website and Make your Favicon. ( the extension of the favicon will be .ico ). 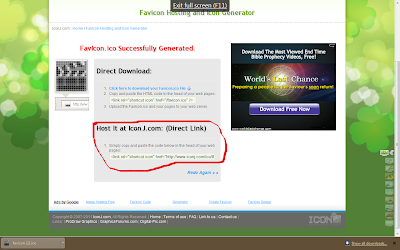 Once you have copied the link for your favicon, you need to edit your blogger html. Dont Freak out ! Its easy as a pie. Sign in to your blogger dashboard. 3-Once you find this code, place your Favicon URL within the following code and place your favicon under the code mentioned in step 2. Click on publish now and your done. In case the favicon isn't appearing you may wana try refreshing the page.